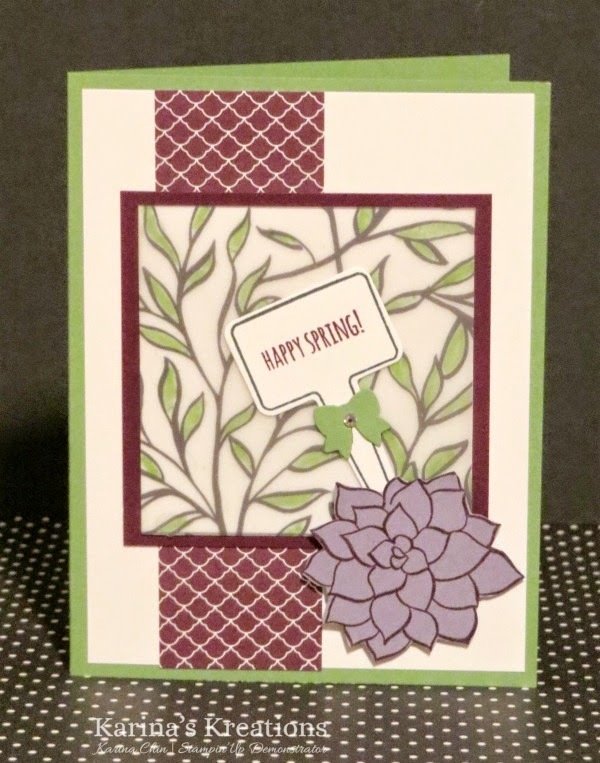 Karina's Kreations: Stampin'Up Nature's Perfection Card! There are only 14 days left of the Sale-a-bration sale. It ends March 31. Did you get the Nature's Perfection stamp set for free or the Sheer Perfection Designer Vellum? I used both of the items on this card along with the From the Garden stamp set and matching Handpicked Framelit Dies. If you live in Canada you can place an order here! I would be happy to help you. I colored the back of the designer vellum with Wild Wasabi Stampin' Write Markers. My card stock colors are Wild Wasabi, Blackberry Bliss and Wisteria Wonder.